An octopus (plural: octopuses, octopi, or octopodes) is a cephalopod mollusc o the order Octopoda. It haes twa eyes an fower pairs o airms an, lik ither cephalopods, it is bilaterally symmetric. 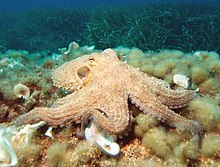 An octopus haes a haurd beak, wi its mooth at the center pynt o the arms. An octopus haes no internal or external skelet (althou some species hae a vestigial remnant o a shell inside their mantles), allaein it tae squeeze through ticht places. Octopuses are amang the maist intelligent an behaviourally flexible o aw invertebrates. ↑ "ITIS Report: Octopoda Leach, 1818". Itis.gov. 2013-04-10. Retrieved 2014-02-04. ↑ "Facts About Octopuses". Retrieved 22 April 2014.